Last summer, after reading the first few collected paperbacks of Justice League International, I discovered that one of JLI members, Booster Gold, had their own, fairly new ongoing series. So I decided to pick up the first three trade paperbacks and then start subscribing to catch up with what was going on currently with the character. I really enjoyed the series for several reasons: it was well-written, the art was lovely, and because I picked up the storyline at about 20 issues in, it was easy for me to catch up and actually have read a complete run of a series. That last part felt pretty good for a new comics fan. But there was also something else I enjoyed about the series: it was highly accessible to the new reader. Each issue (or "chapter," as I was reading it in its collected form) always started out the same way: Booster Gold introduced himself and what he was all about. Sometimes he'd even introduce secondary characters like Rip Hunter. And more often than not his little "voiceover" bubbles would also catch the reader up on what happened in the previous issue. While it bordered on the annoying to hear Booster Gold tell his origin story for the twentieth time, it wasn't hard for me to skim over it and ignore if I wanted, and here's where the writers had hit upon a story device that was very newbie-friendly without being too in-your-face. I had no trouble jumping right into the story. I felt like I knew the characters, even if I had never read a story about Michelle, Booster's twin sister, I knew who she was. I had no trouble remembering what happened last month because I always had the luxury of a recap at the beginning of every issue. And if you're telling an on-going story, with no idea of when a new reader might jump into a series, you've got to at least have the latter to have any hope of winning over a new fan. Taking a page from the Joe DiMaggio playbook and writing each story as if it were someone's first comic might be a good maxim for comic writers to take to heart. It might need to be as involved as Booster Gold's constant introductions, but at least recap what happened last month. I read too many comics to remember what happened in the previous issue, let alone what happened last week. And a little exposition isn't going to kill the story--the veterans can just glance over it and get on to the new material. So, in short: catch us up a little, comic writers! Give us a short recap. Let the characters talk about themselves and explain who they are once in a while. Sure, it might work better for an egotistical character like Booster Gold to constantly be talking about himself, but I'm sure there's a way to make it work for any character. I know some series do some recaps already, but I can't think of any series which has its protagonist introduce himself and other characters as often as Booster Gold does. It would be more helpful if recaps and character histories were more obvious and direct...hearing a character introduce himself on a monthly basis certainly helped win me over to the Booster Gold Fan Club. If only I had the guts to wear this in public! can we even buy that t shirt? i'd wear it. it's not like anyone over here would knwo what it meant - they'd just think it was cool and retro. and it is a lovley design. I absolutely agree. Captain America comics did a simple blurb on the first page of each issue during the "death of" story and that was very helpful. I can't tell you how many times I start reading a comic and can't tell if A) I somehow skipped last month or B) I just can't remember what happened last month. Maybe if they did the opposite of what Batman and Robin does (one page with three or four panels - no text - showing what is coming next month) but instead put a page at the front briefly showing what happened last month. I understand it eats up a page and takes away from new content, but if it's done right it can be made to enhance the experience for old and new readers alike. TV shows always do this. Another example of the comics industry's lack of plain old common sense. 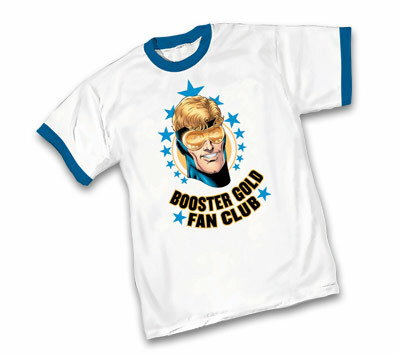 You might also like SHOWCASE PRESENTS: BOOSTER GOLD, which reprints his first series from the 1980s. That Booster Gold Fan Club T-Shirt shirt is for sale from Graffiti Designs, the t-shirt licensing distributor for DC Comics. You can find the shirt on their website (here), but there service tends to be a little slow, so you may have more luck at a comic retailer or online. Oops: that should have been "Graphitti Designs" for those of you keeping track of spelling at home. So, in short: catch us up a little, comic writers! Give us a short recap. Bendis did this (or "introduced" it) over at Marvel, it proved really popular, and then they stopped or did it really infequently. I remember Image did this too. Somehow, comic publishers and writers don't keep up with it. i really like the catch up bits at the start of trades like Rucka's WW run, or the YJ or JL books, where they gave a 1 page synposis of previous story arcs and explained who each hero and villain was, with a picture of the char's head next to the biography. Really really useful and less annoying that recaps every issue! 1truegl, it's too bad some writers have let things like recaps fall by the wayside. And I definitely couldn't understand anything Marvel without some sort of help. "with a picture of the char's head next to the biography." I like that a lot, too, Saranga. It's kind of like the roll call that sometimes shows up in older JLA issues. Reading trades is also a lot more accessible in general, but extra material like character bios make it that much more newbie-friendly. First Comics started the inside cover recap. I used to be able to recite Grimjack's standard introduction from memory, though not the quirky variations that sprang up as the series progressed. Jim Starlin used to be the master of the 1-2 page series recap in every issue. Again, he'd have different characters provide the commentary, offering enough variation that I enjoyed reading it every month (or so,) though it gets tiresome while reading a run in one sitting. I don't think Liss would appreciate Warlock, but The Life of Captain Marvel or Dynamite's Dreadstar collection would seem right up the alley of an Adam Strange fan. Will The Wonders Never Cease?